Caladiums are one type of plant that can add beautiful color to the shady parts of your yard. 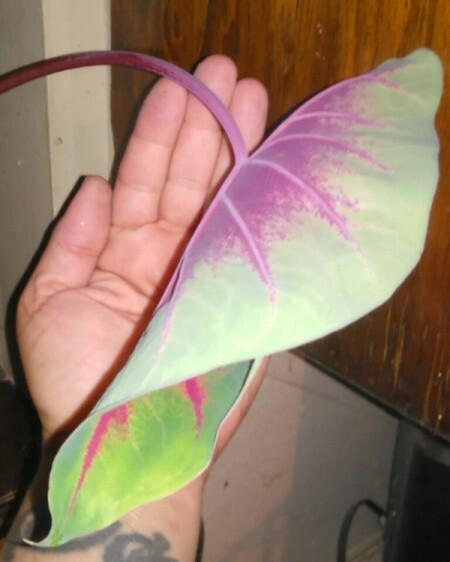 They are tropical beauties that come in a wide variety of colors and patterns. Caladium bulbs are some of the easiest bulbs to grow (as evidenced by the fact that I'm actually growing one!) They grow well in the partial sun/shade and full shade areas of your yard, offering lovely summer color in zones 10-11, or they may be brought indoors for the winter. However, they also make beautiful house plants year round. 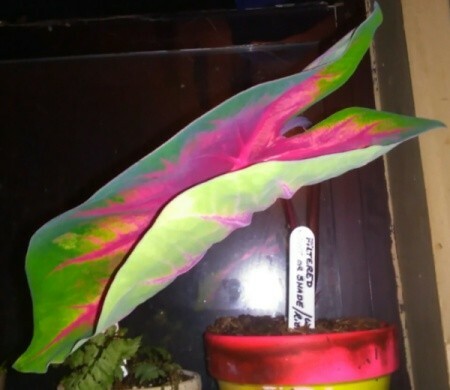 Caladiums are extremely fast-growing. I planted my bulb on 5/1, and had a 1" spike by 6/21. It was 1 foot tall 3 days later. The rest of these photos were taken on 6/26! 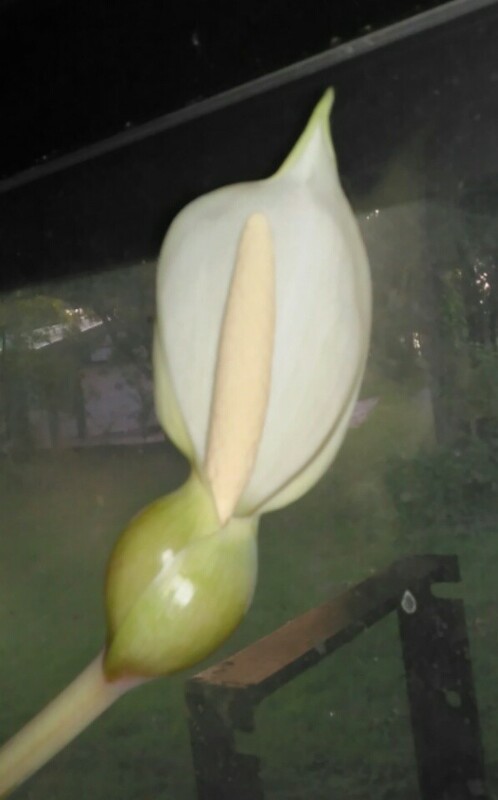 It has a developing flower which will be white and somewhat hour-glass shaped, similar to a pitcher plant. Mine grows very well on a window sill with filtered light. My particular variety will reach an appropriate height of 2ft, and will, as mentioned, grow the occasional amazing flower. 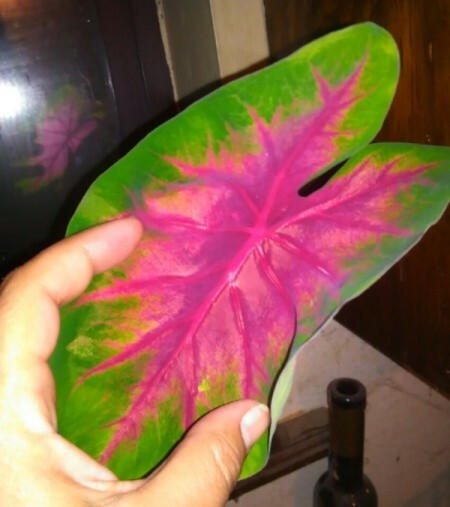 The Florida Cardinal caladium has one of the brightest red centers of any caladium, although apparently the youngsters are hot pink. I recommend trying a caladium bulb if you find you love plants, but have a hard time growing them. First of all, they are very easy to grow, improving your success rate and faith in your ability. They will definitely satisfy and amaze you with their sheer beauty and amazing growth rate. And they will come back to reward you year after year. They have been a lovely addition to my home, and have given me an incredible sense of hope for the future of my ability to enliven my surroundings with houseplants. There are so many beautiful varieties to choose from that you're bound to find and fall in love with just the perfect beauty for you! Good luck & God Bless! Happily outgrowing it's first pot, on its home windowsill in Central Oklahoma! I grew Caladiums one year. They are very easy to grow. And, you are right. They grow very fast. In just a little while, I had a whole host of colors and patterns. Overall, there was none really pretty or interesting. I said I would not grow them, again. And now, you introduce me to the Florida Cardinal variety. The colors are brilliant and I have just the shady spot for them. If I can find this variety next Spring, I will be planting lots of them.